Bruce Nauman, Life Mask (1981), lithograph, 71.1 x 96.5 cm. Edition of 50. Printed by Charly Ritt, Gemini G.E.L, Los Angeles. Published by Gemini G.E.L. Courtesy of Galerie Ronny Van de Velde and Sims Reed Gallery. Just five minutes walk from the Royal Academy of Art, where almost twenty years ago Charles Saatchi presented the infamous “Sensation” exhibition of the Young British Artists, Sims Reed Gallery recently presented a choice survey of the prints of Bruce Nauman. I make the connection since Nauman seems to be one of the dominant influences on that YBA generation: Damien Hirst, Jake & Dinos Chapman, Tracey Emin, Marc Quinn and Rachel Whiteread have all drawn on ideas and propositions initially floated by Nauman. 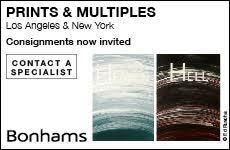 This print exhibition is a reminder of his continuing influence, the edgy nature of his work and his unsettling vision. Two series bookend the current exhibition: the five screenprint Studies for Holograms (1970), and Infrared Outtakes, a set of four inkjet prints from 2006. While these photo-based works derived from performances, the majority of the works on show explore verbal language. For Nauman, words seem like ideas formed in the mouth, fluid and prone to slippage. In Holograms, he contorts his mouth as if to form letters, which might equate with sound. Printed in a silvery gray halftone and an acidic yellow, they become disembodied, his face taking on an eerie quality, less like flesh than infinitely malleable clay. The connection between the prints and video pieces such as Pulling Mouth, made a year earlier in 1969, is enhanced by the fact that the image bleeds to the paper edge on the horizontal sides but leaves a white border top and bottom, leading the viewer to read them as a sequence of frames, edited cuts from their video origins. In Holograms, Nauman’s face is the material being shaped into new configurations; in many other prints, it is words. In NO, a lithograph printed and published at Gemini G.E.L. in 1981, the single word fills the image like an exclamatory declaration. Drawn with tusche, it sensuously explores the range of nuance and tone possible through lithography. 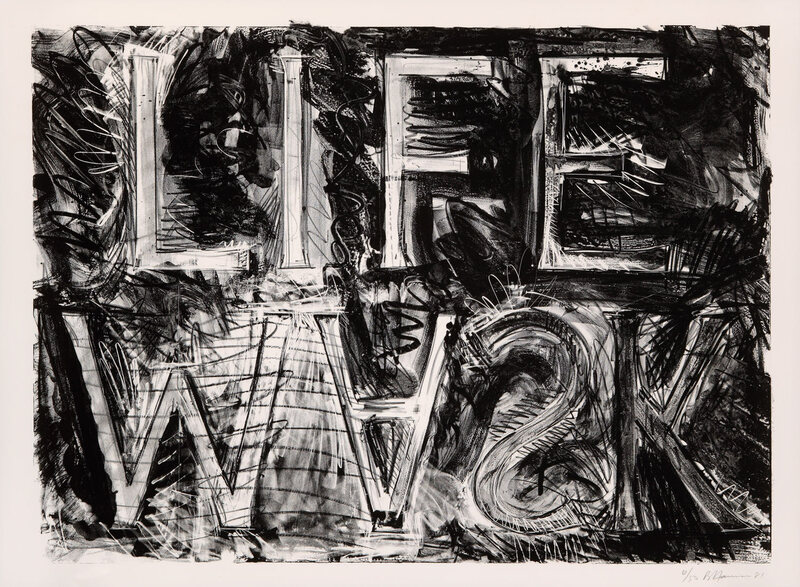 Referring to Jasper Johns’s use of numerals and letters, Nauman reveals the word’s presence while dissolving it. The result is an image in a constant state of transition. Bruce Nauman, from Study for Holograms (1970), portfolio of five screenprints, 66.04 x 66.04 cm each. Edition of 150. Printed by Aetna Studios, New York. Published by Castelli Graphics, New York. Courtesy of Galerie Ronny Van de Velde and Sims Reed Gallery. Nauman plays with words like a cat with a ball of wool, teasing them, unraveling them, reshaping them, separating them from their dictionary definitions. 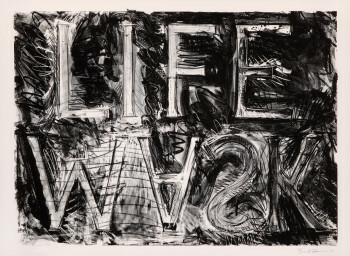 An elegant lithograph from 1981, Life Mask, presents the two title words drawn above each other. But while LIFE is drawn correctly, the letters of “MASK” are flipped upside-down:, the M becomes a W and the viewer is left with the task of decoding. The reading oscillates between LIFE MASK and LIFE WORK, while the agitated gestural marks used to articulate the letters assert that this is not a text but a drawing of words. It also plays and engages with the process of lithography and the reversal of image that occurs through direct printing as well as the positive-negative reversal involved in the taking of a life mask. AH HA, a screenprint from 1975, forgoes the autographic mark for clean sans serif letterforms, black-on-white and white-on-black, mirrored on a vertical axis. Both words exist as independent entities as well as reflections of each other. Reality is momentarily destabilized. AH HA might be a reference to the grotesque character Bosse-de-Nage in Alfred Jarry’s novel Exploits and Opinions of Dr. Faustroll, Pataphysician, who can only utter the words “Ha Ha,” onto which a myriad of meanings is projected. In the three lithographs Perfect Door, Perfect Odor and Perfect Rodo (1973) the word is again typeset. As Lucy Harbutt writes in the catalogue that accompanied the exhibition: “These works through the simple re-arrangement of letters, show how language can be easily manipulated, and in doing so how meaning can be dramatically altered, changing our experience of it.” As a series it sets up expectations only to frustrate. It begins logically enough—a perfect door might indeed exist, though a perfect odor is difficult to imagine and “perfect rodo” leaves the viewer desperately in need of resolution. The 30 prints on view at Sims Reed were all pristine impressions, as fresh as the day they were printed. The display brought out the importance of pairings and series in Nauman’s work and, within the limitations of the gallery, the viewer was given ample space to engage with each. In many respects the prints are quite straightforward: each is resolved through a single process and all sit comfortably within the technical and social conventions of printmaking. The unease, the power to shock and disturb they contain is inherent in the content and the directness of their execution. It was surely these qualities that made Nauman so critical to the YBAs, and the radical position he has maintained over his career—clearly evident in this exhibition of prints—provides a benchmark against which they will be judged.